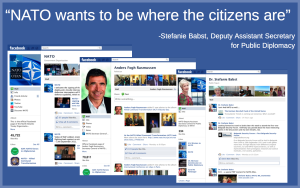 In a previous post we discussed a few of of the ways government is using social media to interact better with citizens. Asking for ideas for new health apps, live blogging events (DECC’s Pylon design competition) and MoD’s personal security for social media campaign going viral on YouTube are a few recent examples. Once a month a cross-Government group called 'Heads of Digital Engagement' meet to discuss, share and problem solve issues relating to government’s use of social media. Periodically we hold a workshop on a theme to focus attention on a particular area, fleshing out any issues and sharing best practice by speaking not only to familiar colleagues but also hearing from other people, groups and organisations. Departmental Facebook pages (e.g. 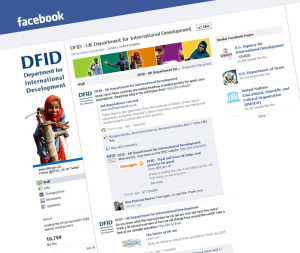 DFID and Armed Forces day) are now commonplace and therefore we thought is important to have a workshop focused on Facebook. We were fortunate enough to have four sets of speakers each bringing their own perspectives, experiences and anecdotes. Following the session which delivered pointers to lots of useful Google tools, next up was Facebook. This was a slightly more structured session, in that it was opened by Richard Allan, currently Facebook's Head of Policy in Europe. Richard introduced a colleague from Facebook who shared a wealth of interesting hints and advice on how organisations can make the best use of Facebook pages. Their presentation was followed by three insights from colleagues who make use of Facebook pages to communicate the work of their organisations: Ally Hook from Coventry City Council, David Bailey from Staffordshire Police and my own colleague from DFID: Simon Davis. Hard to know where to start with the Facebook hints – but in essence, the room was probably split between people who have already some experience with pages, and this half was nodding in agreement with most of the examples given – and the occasional “oh, I wish I’d known that was possible….”, while the other half were there to absorb and ask lots of questions. Overall it served to re-affirm a lot of the things we are doing and it was good to hear from colleagues who are in the same situation. The advice centred on making use of ‘pages’ – and we saw lots of useful examples of what can inform your choice. NATO, for example has a page for the organisation, the Secretary-General and for heads of specific sectors (e.g. Dr. Stefanie Babst). If you have a high profile person as your head, especially if that person has a political role, it is advisable to keep that separate as it is easy to link the two together – and it will enable visitors to decide whether they want to follow the organisation or the person. Regarding personal pages – Facebook's policy is to create landing pages for significant figures, usually by linking to their Wikipedia entry. 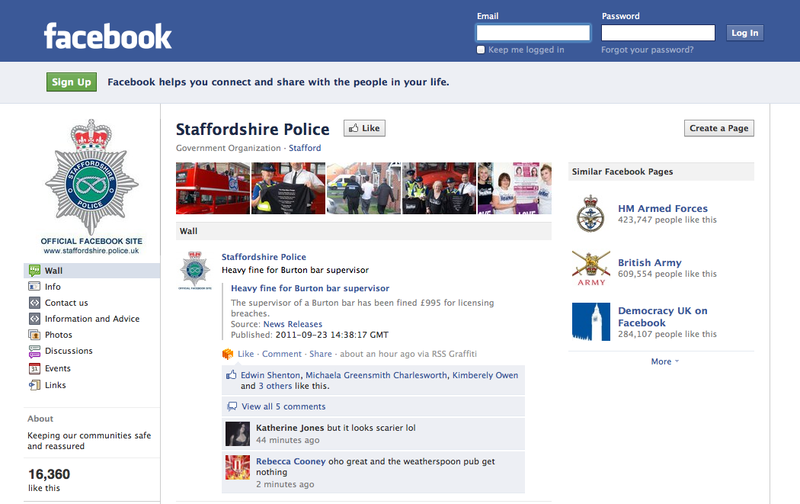 This will be removed and replaced as soon as Facebook are notified that the individual has created their own. It was interesting to hear that this is also how Facebook deals with historical figures – go have a look at William Shakespeare. It's unlikely to offer much interaction but does have over ¼ million fans! Hints for raising the profile of your pages include tagging wherever possible, including photos, and using one high profile page in a sector to tag another. A useful reminder for page admins was that they can log in to Facebook and switch profiles – carrying out activities as their page. Facebook has a profanity filter for inappropriate comments and it is possible to ban members from posting comments (although in the examples round the room this has actually been used infrequently in practice). Many organisations may also choose to remove the ability to initiate comments (e.g. post directly onto their page) whilst retaining (and indeed encouraging) visitors to comment on topics the organisation initiates. 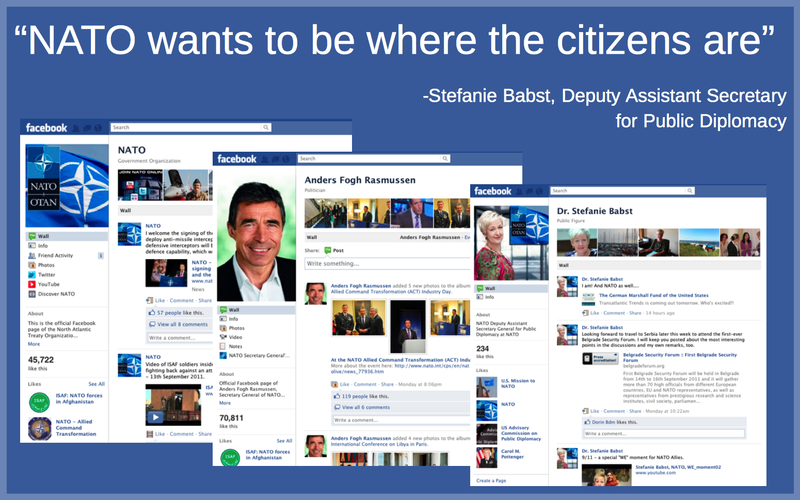 Page administrators were reminded to look at Facebook's straight-forward guidance. Facebook will always post updates about changes that are made. There are also pages on safety and security – which should answer many of the most frequently asked questions. An interesting question was around exit strategies- what do you do with a community once the campaign that sparked it off has run its course? If there was a new, similar page then the admin could post a few times and point fans to this new space – advising them to follow that too if they were still interested. Then, after a time, proactive activity could be ceased. An alternative would be to set up the page with a very broad title so it can be used as a platform for a series of activities allowing you to take your growing community along with you. Both Coventry and the Staffordshire Police showed how addressing a local audience can really benefit from a specific event. In Coventry’s case this was meeting a need for information during last winter's unusually heavy snowfall which resulted in schools and public services being reduced. For the police it was how they were able to respond to the recent riots. 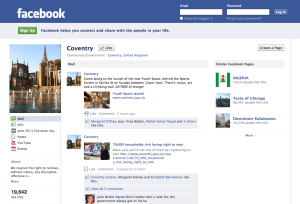 Coventry Council made a conscious decision in their foray on to Facebook to make their pages as inclusive as possible while building on earlier conversations about specific council business. They named the page simply “Coventry” and while they didn’t hide the fact it was council initiated (if you looked closely) the main branding was more general-images of Coventry instead of the council logo. There is a team of people behind the page - no automated posting of material, and they aim to stimulate conversations and answer questions. Echoing our own experience at DFID, when there is a critical voice or bad-natured comment their first reaction is not to block it or step in with a counter comment. Instead they watch and wait and very often other members of the community will step in. Their key period of expansion was during last winter's heavy snowfall: they went from just over 500 fans to 11,000 in 2 weeks! They had direct links with schools and quickly became the official source of information on which schools were closed – in one instance countering the cheeky initiative of a young pupil who managed to convince a local radio station that he was a headmaster and got them to announce his school was closed! They quickly confirmed and broadcast that the school was open. Ally (E-Communications Editor) confirmed the value they find in Facebook insights, Facebook's inbuilt analytics package. The ability to find out a lot about their fans, how they find the page, what interests them plus a raft of demographic data, is hugely useful in helping to inform future focus and communications. She confirmed that sport, employment and potholes are their star topics! Key points from David Bailey (Communications Manager) echoed many of Ally’s. Fundamental was that social media formed the bedrock of their communications during the riots. They placed a notice on their website which directed people to Facebook for detail, and Twitter for up to the minute alerts. Key for me was their evidence countering the view that quickly spread in the mainstream media, that social media was somehow to blame for accelerating the riots – with calls that it should be switched off at the height of problems. Examples such as this demonstrate strongly that it is an equally, if not more valuable, part of the solution. 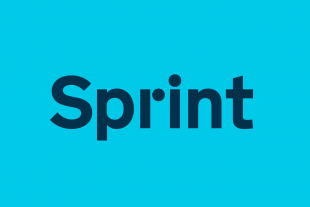 Elements included members of the team being highly alert to potential problems and quickly drawing up a communications plan with issues such as 24 hour working agreed so that the team could respond immediately. Senior members of the force were involved, including being interviewed for podcasts which served to reassure members of the public that the police were on high alert and ready to act. These podcasts were rebroadcast by local radio. The police, in a similar way to the Coventry team, experienced an unusual turnaround in that local media recognised their direct connection to a local audience and called them to ask them to publicise announcements! Another notable element of their communication plan was to make sure their own colleagues knew what was going on. Families were reassured via the social media updates, and colleagues heard via a series of “news from the chief” emails. A nice touch was the creation of Wordles to illustrate the tone of online coverage – overwhelmingly positive and appreciative. An evaluation of their activities has been published – worth reading. 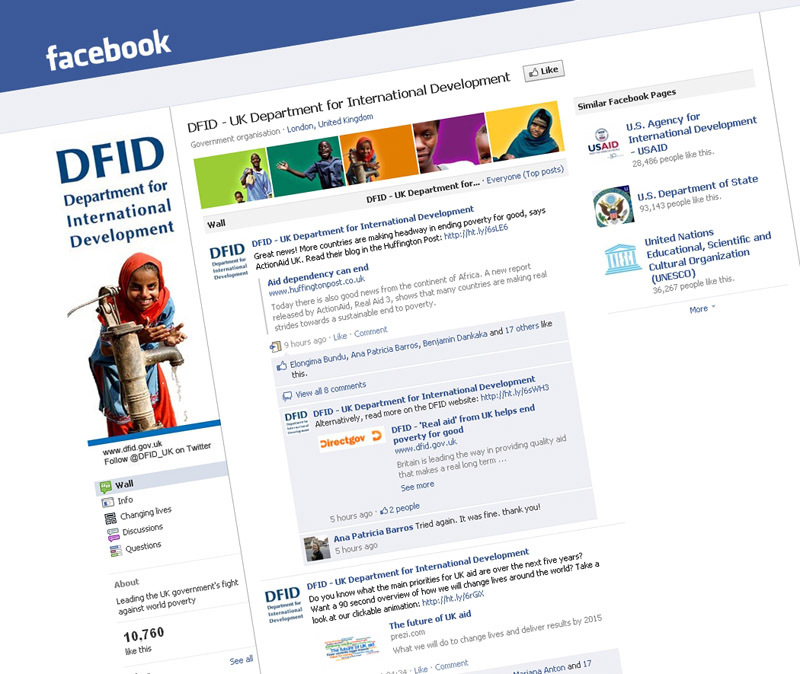 Last but not least, Simon shared some thoughts on DFID’s Facebook activities. Key points for us are a move away from purely signposting content published in other places (primarily the website) and creating content specifically to publish on Facebook. We are focusing on creating a community where interaction is frequent. The most colourful evidence of this is a series called “Changing Lives”. This is the banner which introduces a whole series of stories about how aid has made a difference in people’s lives. We used a tool called thrusocial to create a landing page which we switched to be the default when people find us on Facebook. We are experimenting with frequency of posts, but in general we aim for a steady flow – interspersing announcement of policy updates with lighter touch material such as a “Where in the world” photo competition and quick quizzes on news-prompted issues – for example an item on new research into ways of tackling malaria. When we introduce links to material from other organisations, we will frame it as a question – again with the intention of stimulating debate, rather than simply directing visitors away from our space. Please note, this text was also published on Julia's blog. Facebook clearly has a massive following but the useabiltiy of Google+ to my mind is far superior and will rapidly gain ground.